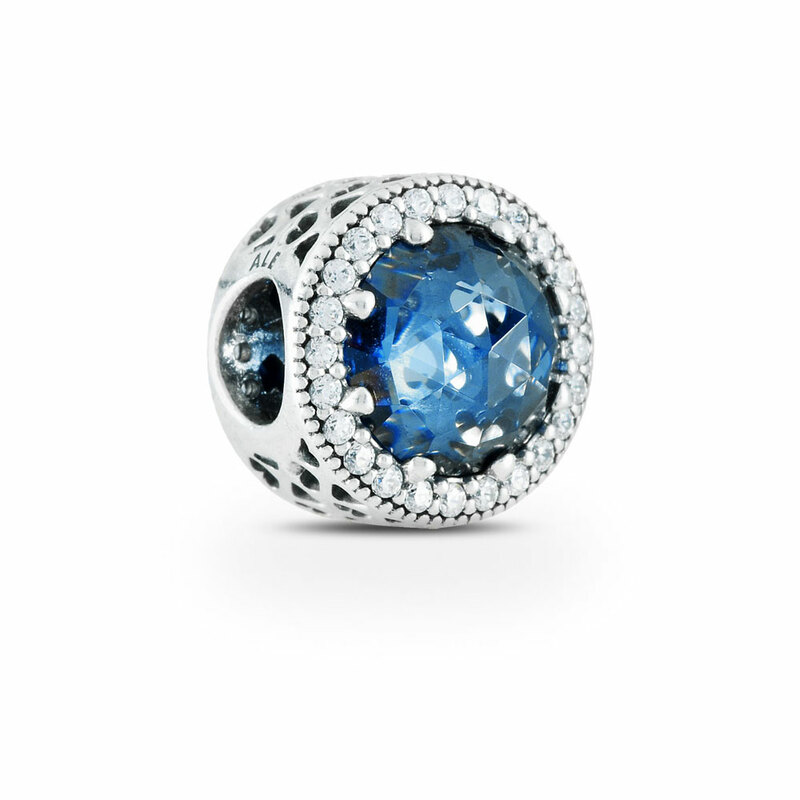 This elegant button-inspired charm is embellished with rose-cut stones in a lovely blue hue, framed with twinkling cubic zirconia stones. The sculptural design looks stunning from all angles; the heart details beneath the stones and the row of cut-out hearts on the side give the charm a romantic twist. Available online or in-store.This item is a single charm only. Bracelets sold seperately. Styling images may show this charm on a bracelet as styling inspiration. Moonlight Blue Radiant Hearts Openwork Charm is rated 4.8 out of 5 by 39. Rated 5 out of 5 by Niteyue from I L O V E IT OMG my FIRST ever Pandora, and I love it, I love it, I love it (important thing say 3 times) it is beautiful and elegant matches with all the blues or silvers. or by it's self. Rated 1 out of 5 by sher bear sherry berry from Color faded to a very light blue Received this as a Christmas present from my husband and it’s faded with everyday wear! Rated 5 out of 5 by MTM494 from Stunning Charm My daughter loves sapphires and every year I buy her a Pandora charm for Christmas and then another for her birthday (4th January). I love the size and the colour is stunning so I'm sure this will be a wonderful addition to her charms. Rated 5 out of 5 by Tabby from Vibrant! I bought it for my 'blue bracelet' to go with my collection of blue charms, which I just started. Rated 5 out of 5 by Trudy Kins from Beautifull color dept to stone with elegant settin Bought for my wife's Birthday and she fell in love with it ! Rated 5 out of 5 by Mimih from Beautiful I bought this for my daughter. It goes together with the other charms and is beautiful. She loves it. Rated 5 out of 5 by Mia H from Very pretty charn I received the lovely charm and I love it. So pretty. I started a bracelet with all blue charms and this is one of them. Couldn't be happier with it. I recommend it.